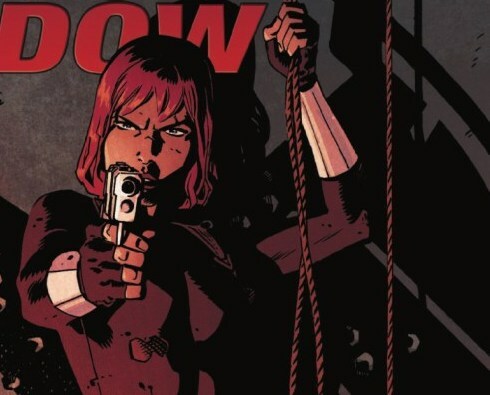 Black Widow #12 Review – AiPT! Black Widow is attempting to close a door on an exciting story that Chris Samnee and Mark Waid have built up over the entire run of this series. Does it end well and is it good? So what’s it about? Read the preview here! Simply put, this has been a very cinematic and exciting story arc. Chris Samnee has been drawing lights out comics and with the aid of Mark Waid they’ve added a new layer to the character’s back story. It’s a big success and should be a fine collected story once this issue is out! This issue opens where we last left off and it’s not looking so good for Black Widow. She’s overpowered and all of SHIELD may come crashing down because she’s failed. Even worse, the girls she swore to save are helping to take her down. It’s a high stakes situation and Waid/Samnee use a bit of clever choices to get the plot moving. That includes a fantastic page intercutting a clock being used to synchronize the end of SHIELD as we know it. Essentially Black Widow must use her wits to get out of this issue, but also her words. It’s a fine way for this conflict to wrap up seeing as she’s shown her physical prowess more times than one can count already. Once again this a visually satisfying issue that’s exciting due to the fantastic art. If you’re a budding artist you gotta see this issue for how Samnee draws water. There’s a lot of it in this issue and Black Widow is fighting against it throughout. It looks great, and has a weight to it that makes it feel dangerous. Maybe it’s the fact that the blue highlights the blackness of it, or maybe it’s how it is drawn all around, but it’s a factor that makes the climax exciting. As if rendered to look similarly dangerous, the girls are stark black with only red masks to highlight they are even people. They look dangerous and inhuman which is a nice touch given how they’re young, but so very deadly. Time is NOT on their side! In the closing pages we see SHIELD operatives (I think that’s who they are) hugging the orphans. With tears streaming and happiness in their eyes I wondered, “Who the hell are they?” A character mentions they’ll get the best foster parents ever so who the hell are they? I imagine it’s a nice way to show the kids are better off so we get an emotional end for them, but it was downright confusing. This is a good conclusion, but it doesn’t necessarily stand on its own. Don’t read this expecting a singularly great story without context! A satisfying end to a series that’s visually stimulating and well worth a look. Black Widow is made more interesting in a fulfilling and action packed series! Not sure who the people are hugging the girls but why are they so joyess!? Doesn't stand on its own. You gotta read the last few too!